Silver James…my first guest ever…drumroll please…. I am pleased to introduce Silver James as my first ever guest blogger Not only is she a fantastic writer, she’s a great friend. Silver has come through for me in many, many pinches, and I’ll be forever grateful. I’ve had the privilege of reading the first two Faere books, and they were wonderful. Silver has a gift for weaving heart-pounding romance and nail-biting suspense into her uniquely creative paranormals. Can’t wait to read Faere Fool! I don’t know whether to feel honored or like a guinea pig to be Alicia’s first guest blogger. I’ve known her for several years now and I’m lucky enough to get to call her friend. She offered me a lot of options but since I have a new book out, I figured I’d talk about how it came into existence. 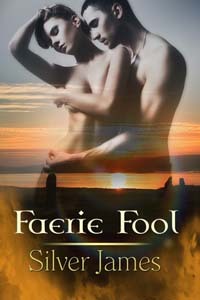 FAERIE FOOL is the third book in my “series that isn’t a series” based on Celtic legends about reincarnation, soul mates, and the Irish fae known as the Tuatha de Danaan. The first two books, FAERIE FATE and FAERIE FIRE, introduce the reader to the world of Manannán mac Lir, the king of Tir Nan Óg, and the humans he’s taken special interest in. As faerie royalty, Manannán rules over the Land of Ever Young, the magical place where souls go to live happily ever after. Only sometimes, the humans aren’t all that happy to be there, stuck for the rest of time. They’ve left behind unfinished business. Or true love. When I started writing FAERIE FATE, I knew there would be three books. FATE and FIRE almost wrote themselves and once they sold to The Wild Rose Press, they released within months of each other. While I knew FOOL would be Riordan MacDermot’s story, I didn’t know how the story would start, how it would evolve, or how it would end. I turned to other projects, writing two novellas for Wild Rose’s Class of ’85 anthology series. I wrote my Moonstruck series about a group of werewolves who are in the military. I wrote the first book in an urban fantasy “epic” series, and the beginnings of a Gothic romantic suspense series. In the meantime, Rory and I fought. A lot. In my head. I should probably mention that writers have people and voices living in their heads and we talk to them. Often. 😉 Determined to get his story told, I thought he should be a military sniper. After all, he’d been an Irish warrior in the 9th century, and an Irish Army Ranger in the 20th. But he just wouldn’t cooperate. Time slipped away. Other projects came into being. And I left Rory behind. Then I attended an OKRWA meeting where a member of the sheriff’s department SWAT team presented the program. Rory stirred in my imagination. He stretched and yawned while I scribbled copious notes. Pages and pages and pages. The next morning, I woke up, sat down at the computer but instead of checking email, twitter, and blogs, I started writing, his voice whispering incessantly in my ear. I didn’t stop. I couldn’t. Rory never gave me a chance to write myself into a plot corner. He never doubted this was his story, his heroine, and his battle with Abhean, the faerie harper who lived to create problems for Manannán mac Lir and the humans under the king’s protection. I made myself laugh. And cry. And when I finished and turned the book over to my editor, I knew Rory was proud of me for getting his story right. As a writer, that’s the highest compliment I can receive—that my characters approve of their story. It doesn’t hurt when readers let me know they love the story, too. If you had one shot—just one opportunity to seize everything you ever wanted in one defining moment, would you capture it or let it slip away? In a previous life long forgotten, Rory MacDermot vowed never to lose his heart. But then he meets Delaney Burns. Again. In life after life, the man Rory was slips beyond Delaney’s grasp, and she falls for the wrong man. This time, Delaney turns to Rory for solace and discovers she’s loved him in every lifetime. So why the barriers between them? Neither believes in reincarnation, but as their dreams reveal the past, they realize their memories hold the key to the future. To keep history from repeating itself, they must pronounce the binding words before the Faerie feud spills into the mortal realm, but the words dance beyond Rory’s memory. When the fae harper arrives to collect Rory’s old debt–his life for Delaney’s–he’s dragged to Faerie, leaving Delaney the hostage of a disturbed man. Can Rory escape and save her? Or will he lose her…this time forever? Just remember, without the words, history is doomed to repeat itself when you deal with magic, the Fae, and true love. What about you? Do you believe in reincarnation? Faeries? Magic? No? But as a romance reader, surely you believe in true love, right? One commenter will be chosen at random to receive a copy of FAERIE FOOL, either in print (available now) or in the digital form of their choice when it releases in ebook on November 30th. You can buy all the Faerie books from THE WILD ROSE PRESS and from Amazon. Please check out FAERIE FOOL on Amazon. Great post, Silver. As I read it, I could hear your voice speaking. Funny. Best of luck with the series. It sounds fabulous. I’m so glad my Rory got his story! On my keeper shelf and will be on my kindle as soon as it is available. Y’all. Meet Liza. She’s been Rory’s number one fan from the very beginning. Friday, Liza. It’ll be available in digital format on Friday from Amazon, Wild Rose, and eventually All Romance and all the other outlets! Nice to meet you, Liza. Thanks for stopping by and visiting with Silver. You, too, Callie. And, Silver, I appreciate you kicking off my new venture. Enjoy! Interesting, how it all came together. Isn’t it great when it works out that way? Great blurb…a must read for me! Hi, Valerie! Thanks so much for dropping by. 🙂 I’ll put your name in the hat for a copy. Loved this post – I love how you were inspired to write this third book. 🙂 I am looking forward to reading Faerie Fool so much. I totally believe in true love, I like to think there are faeries in the world and reincarnation fascinates me, but not sure I totally believe it (but I don’t count it out totally either). Hi, Chrystal! You need to check out the acknowledgements in the front of FAERIE FOOL. Just sayin’! 😉 Y’all can blame Delaney’s BFF Bronwyn on Chrystal. 😆 Thanks for dropping by! Thanks…glad you love the blog. I appreciate you stopping by! I can’t wait to read Faerie Fool! Faerie Fate was my favorite, but I’m SO EXCITED!!!! Congratulations on getting Rory’s story right. I know it’s not always easy.